The town of Fiesole is on a hill just a few kilometres north of Florence, yet retains its own personality and charm and has several interesting monuments, as well as lovely views across Florence making it a very popular day trip with visitors to that city. It is remarkable how close to Florence you are when you visit Fiesole, since it feels like a separate town set in the wooded hills and olive groves of Tuscany although it is really just a short bus ride away - catch the bus number 7 from the train station or from Piazza San Marco in Florence centre. Historically the town has been considered as a tranquil escape from the heat and crowds in Florence and it is a popular day trip for those staying in Florence. 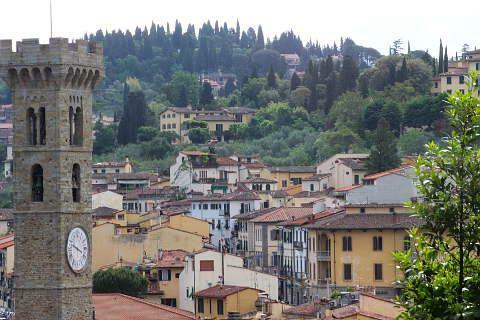 We stayed in Fiesole in order to visit Florence and found it to be an excellent base. 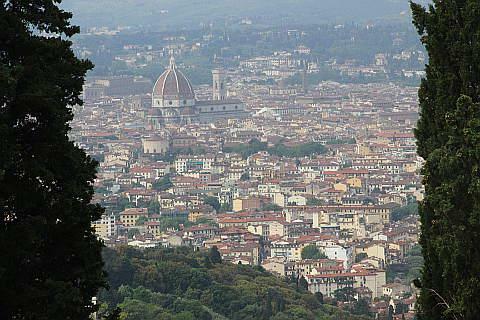 Accommodation is cheaper, the bus ride is only 15 minutes (and only 1€20), it avoids driving on Florence's busy roads, Fiesole itself is very nice, and to cap it all the views from Fiesole over Florence are spectacular. Although the principal pleasure of a visit is simply taking strolling the streets taking in the atmosphere and enjoying the spectacular views across Florence in the valley below, there are also several sights of interest to enjoy while you are here, most of them close together in and near the Piazza Mino da Fiesole. Note that the views are one of the principal highlights of a visit to Fiesole so we recommend you visit on a day when the skies are clear. This square is the best place to start exploring and also the perfect place to return to later for a coffee pause sat out on a terrace overlooking Florence from one of the cafes on the square. The main monument you can see here is the 11th century cathedral (duomo) and its original belltower which dominates most views of Fiesole. Inside admire the domed roof painted with frescoes and the black and white painted arches which are typical of many of the churches in the area. 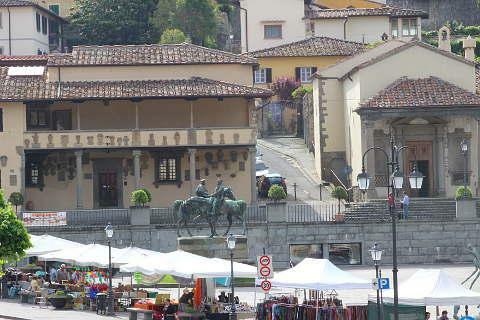 Some of the artwork is by Mino da Fiesole after whom the main square is named. 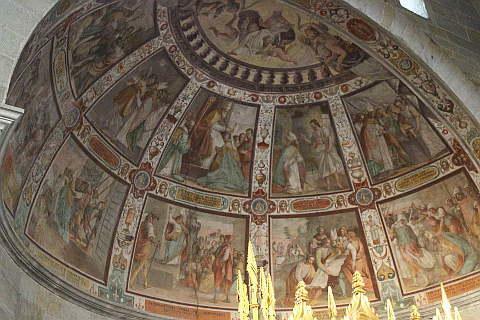 In the crypt of the cathedral are the relics of Saint Romulus. He is said to have been killed by angry pagans in Fiesole in 1028 BC. The Town Hall on the same square is called the Palazzo Comunale and dates from the 14th century. It is a pretty building with a large stone balcony that is draped in flowers in the summer. Standing in front of the Palazzo is a large bronze statue of the first king of Italy and one of his generals, both on horseback..
Next to the cathedral the ancient part of Fiesole, now the archaeological site, has the remains of etruscan defensive walls and also the ruins of a Roman theatre and baths. We had been led to believe there were only sparse ruins of the theatre but really it is very well preserved! On the same site the Archaeology Museum presents artefacts found nearby that originate in the Bronze Age, Etruscan and Roman eras and includes a large number of ceramic items. The Archaeology Site is nicely maintained with cypress trees, grass areas and hedges and one of the most attractively presented ancient sites we have seen. It is useful to remember that Fiesole is actually older than Florence, and has been here since Etruscan times having been founded around the 9th-7th century BC. Fiesole controlled the surrounding region of Etruria for several centuries until the founding of Florence in the Ancient Roman period, in the 1st century BC. 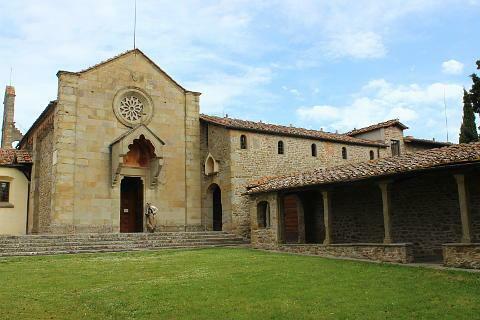 The Bandini Museum here is also popular and features impressive works by several important early Tuscan Renaissance artists such as Della Robbia and Taddeo Gaddi. You have already paid for admission as part of your ticket to the archaeology museum so we do recommend you visit even if you are not (yet!) an enthusiast of renaissance art. Next stop, stroll up (or clamber up - the street is quite steep!) Via San Francesco to the two other princiapl monuments in Fiesole: the 6th-10th century Church of Sant'Alessandro and the 14th century Friary of San Francesco. The first of these was built on the foundations of an etruscan temple. Be sure to turn and look back at the view across the roofs of Fiesole as you walk along the Via San Francesco to reach these two buildings and you will definitely want to pause to enjoy the magnificent view across Florence from the terrace along the road. We found ourselves heading back to this spot each day of our visit to savour the views. Enthusiasts of Renaissance artist Fra Angelico wil also want to visit the nearby Church of San Domenico to see the painting and fresco by this important artist, about 25 minutes walk down a lane from the Piazza Mino. 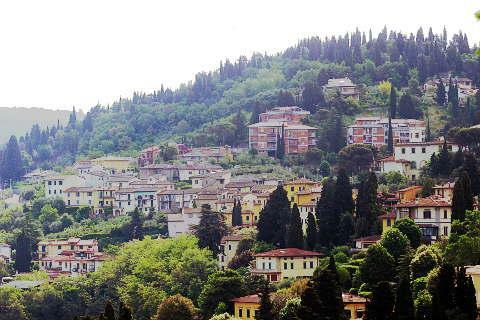 The area around Fiesole is also well known for its villas, often with impressive gardens. These include Villa Medici di Fiosole, Villa di Maiano, Villa il Salviatino, Villa Medici di Belcanto, Villa San Michele, Villa Capponi, the terraced gardens of Villa le Balze, Villa Medici la Petraia and Villa di Castello (these two closer to Florence) and Villa Schifanoia - these are all very lovely and enthusiasts of Italian gardening will want to visit all of them! Also popular is nearby Vincigliata Castle, which is a substantial medieval castle, although much of what you see looks ancient but is really a 19th century reconstruction in the gothic style.